US April factory orders declined 0.8%, reversing part of March’s 1.7% increase. The closely watched core capital goods shipments component climbed 0.9% in the first month of the quarter, supporting the view of a modest pace of equipment investment. There were, however, signs of strain in the supply chain as the number of unfilled orders has climbed in five of the last six months. May’s ISM non-manufacturing reading notched another gain, rising to 58.6 from 56.8 in April. Like the factory orders report, the ISM non-manufacturing report showed that order backlogs are rising at the fastest pace in the survey’s history. Supplier delivery times are also increasing. The diminished slack in both the manufacturing and service sectors of the economy reflects the ongoing robust pace of overall economic activity and signals upside risks to price pressures in the coming months. To that end, the ISM’s survey showed that the prices paid component rose for the third month in a row and now stands at 64.3 – up from 59.9 in December of last year. The final look at first quarter productivity showed that the measure rose 0.4% from the prior quarter but the bigger story was another gain in unit labor costs, which now stands at 2.9% on an annualised basis. The higher unit labor costs combined with the higher prices paid component of the ISM indices also underscore the continual tightening in the labor market. The trade deficit shrunk in April to $46.2 billion from March’s $47.2 billion deficit. Imports in April fell 0.2%, while exports picked up 0.3% for the month. The surprising strength in export growth is likely to add to GDP growth in Q2. The US Bureau of Labor Statistics released its Job Openings and Labor Turnover Survey (JOLTS) this week, and for the first time in the survey’s history, there were more job openings in the US than there were jobless workers to fill them. Despite what appears to be little slack in labor markets amid a 3.8% unemployment rate, US wage inflation remains muted, with average hourly earnings rising just 2.7% in May. Consumer price inflation is above 2.0%, a sign that the US economy is bumping up against capacity constraints. Add higher fuel prices, higher import prices due to increased tariffs, and strong wage growth, and it’s just a matter of time before profit margins get pinched enough for firms to pass on rising costs to consumers. All told, headline consumer price inflation is likely to peak at 2.7% this year, with the Fed’s preferred measure, the core personal consumer expenditure deflator, holding near its target of 2.0% through the end of this year. Stocks recorded solid gains for the week, with the Nasdaq Composite and S&P MidCap 400 indexes reaching new peaks and the S&P 500 Index hitting its best level since early March. Despite setting a record, the technology-heavy Nasdaq lagged the other benchmarks due to declines late in the week. On a sector basis, consumer discretionary shares performed best within the S&P 500 Index, while utilities stocks suffered substantial losses as long-term Treasury yields rose, making their relatively high dividend payments less attractive in comparison. US Treasury yields ended modestly higher for the week after peaking Wednesday afternoon. The return of a sizeable new issuance calendar was the focus for many municipal investors. The issues witnessed solid demand but not the oversubscription that had been a staple of the market over the last few weeks. Weakness in the Treasury market weighed on muni performance, while cash inflows into the sector appear to be concentrating on shorter-term securities. The most important event is the FOMC meeting with the rate announcement due on Wednesday at 20:00 CEST. Consensus is the Fed will hike the target range to 1.75% to 2.00% without making big changes to the updated ‘dot plot’. The Fed is expected to update its language by stating that monetary policy ‘remains modestly accommodative’ with ‘modestly’ being a new word reflecting that the hiking cycle has come a long way and the economy is not not far from the level of the longer-run dot. The US government is going to publish its list of Chinese goods hit by 25% tariffs on Friday 15 June, which would come into force soon after. CPI data for May will be released on Tuesday with the core index expected to continue to rise around 0.2% month-on-month (2.2% year-on-year from 2.1%). Even if inflation surprises on the upside, remember the Fed has said it will tolerate inflation to move above 2.0%, as inflation has been too low for a long time. The governing council of the European Central Bank takes its show on the road next week, conducting a rate-setting meet in Riga, Latvia. Anticipation is building for the ECB to announce on Thursday that the end of its quantitative easing program at the end of this year. Although the move comes in reaction to recent market turmoil, it may have come about also because of the formation of Italy’s new anti-establishment government. Analysts say the ECB wants to send a strong message to Italian lawmakers that it will not be a backstop if the new government exceeds budget caps, which would put pressure on Italian bond markets. While it may wind down QE, observers expect the bank to signal that it is no hurry to hike interest rates once asset purchases are halted. The ECB’s refinancing rate stands at -0.40%. European equities finished the week lower as trade tensions once again rattled financial markets on the eve of the G-7 summit of the US and six of the other largest developed markets in the world, which include four European countries (the UK, Germany, France, and Italy). Following President Trump’s tweet that accused Canada and the European Union of having unfair trade barriers, most European equities headed lower. The German DAX, which holds several export-dependent companies, posted a loss of more than 1.0% by week’s close. The pan-European STOXX 600 Index and the UK’s blue-chip FTSE 100 Index each logged a decline of around 0.8% for the week. European investors remained worried about whether the US would continue to levy tariffs on imported European steel and aluminium. In the euro area, the key event next week is the ECB meeting on Thursday. The ECB had some good news last week from higher-than-expected inflation figures for May, with headline inflation reporting 1.9% year-on-year and core inflation at 1.1% year-on-year. However, the sharp increase in headline inflation was largely driven by energy prices, and the ECB needs more evidence of a sustained inflation pickup. Comments along the lines of chief economist Peter Praet suggesting a labour market tightness translating into wage growth will be monitored. Forward guidance is expected to change in July. The ECB will also publish new growth and inflation projections at the June meeting. On Friday, wage growth for Q1 is due. There is some evidence of a pickup in wages, especially negotiated wages in Germany. The Q1 figures are an important signal for the ECB to consider the outlook for underlying inflation pressure, and it will be interesting to see whether a further pickup in wages was evident in Q1. The services PMI increased to 54.0 in May, from 52.8 in April, to beat the consensus expectation for a smaller rebound to 53.0. The composite PMI was also stronger than expected in May, increasing to 54.5, from 53.2 in April. Services sentiment was pulled up by an improvement in current business activity, with the latest expansion being the fastest in three months. On the other hand, components measuring new incoming business and employment trended broadly sideways from April. According to the survey, new business volumes continue to rise at a modest pace. Survey respondents noted that subdued consumer spending weighed on business growth and Brexit-related uncertainty remains a key factor holding back decision-making among clients. Business confidence across the service sector moderated for the third time in the past four months. The combination of rising salary payments and higher fuel bills resulted in another strong increase in average cost burdens across the service sector. But despite a sharper rise in operating expenses, the latest data pointed to only a modest increase in average prices charged by service providers, according to the survey. 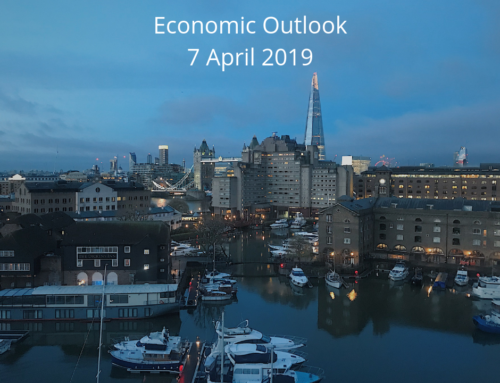 The BoE said 51% of people polled between May 4 and 8 (before the central bank’s policy meeting on May 10) thought rates were likely to rise, down from 58% in February. 25% said they had no idea how rates were likely to change over the next year – a record high. A Reuters poll of economists published on Friday showed the BoE was expected to raise rates in August, but that call was hanging in the balance as policymakers await confirmation that Britain’s economy is past its early 2018 slowdown. On Tuesday, the jobs report for April is due. Average weekly earnings excluding bonuses have risen at quite a stable rate of 0.2% month-on-month this year and this trend likely continued in April. This would leave the annual growth rate unchanged at 2.9% year-on-year. The unemployment rate (3M average) was likely to be unchanged at 4.2%. On Wednesday, the CPI print for May is due out and CPI core is expected unchanged at 2.1% year-on-year, but see a risk that it may have climbed to 2.2% as the negative impact of the Easter timing drops out. Core inflation will likely fall gradually, as the impact of the weaker GBP is fading. Countries are staking out positions on trade and reversing themselves within hours. Last week saw US reversals on several issues, including tariffs on China, with the US now reserving the right to re-impose them. Early this week, China announced that all recent agreements with the US would be voided as a result of the US’ actions. By midweek, however, the country’s commerce ministry was saying that progress had been made and that China does not want an escalation of trade friction between the two countries. Talk circulated this week that China has tabled a proposal in which it would purchase an additional $70 billion in US manufactured goods and agricultural and energy products. An additional source of tension could be China’s massive trade surplus of $24.6 billion, which is about $2.4 billion larger than in April and also greater than a year ago. The key thing to watch for China this week will be whether the US administration carries out the pledged tariffs on Chinese products worth USD 50 billion within the tech area. On 29 May, Trump said the list would be announced on Friday 15 June and that it would take effect shortly after. China has responded that if the US moves on with the tariffs, that the offer from the trade negotiations to buy US goods worth USD 70 billion would be off the table. Sources: Wells Fargo, T. Rowe Price, Handelsbanken Capital Markets, Reuters. Disclaimer - Past performance is no guarantee of future results. Inherent in any investment is the potential for loss. This material is being provided for informational purposes only and nothing herein constitutes investment, legal, accounting or tax advice, or a recommendation to buy, sell or hold a security. The pages of this website may contain materials from third parties, which are supplied by companies that are not affiliated with PuriCassar AG. PuriCassar AG has not been involved in the preparation, adoption or editing of such third-party materials and does not explicitly or implicitly endorse or approve such content. No recommendation or advice is being given as to whether any investment is suitable for a particular investor. It should not be assumed that any investments in securities, companies, sectors or markets identified and described were or will be profitable. All information is current as of the date of publication and is subject to change without notice. While based on sources believed reliable, we do not represent this material as accurate or complete. Any views or opinions expressed may not reflect those of the firm as a whole.